The Best Thing the New Yorker has Ever Published? "A trivial problem reveals the limits of technology" had caught my eye, but not enough of my attention to get me to read more at the time I received the email. In my boredom I finally opened the article and was immediately drawn into the action filled drama that is the world of copiers, xerography, and tribology (don't worry, those words will mean more to you when you read the article, and you should). The article read like the script for an action movie. Full of obstacles to conquer, fascinating sci-fi-esque technology, characters I felt invested in, and a lasting struggle. The article opens with the initial conflict that draws us into the story. Xerox engineers are faced with a problem: a paper jam had occurred in Asia while a client had been trying to print a book. With overwhelming enthusiasm I started reading quotes aloud to Esther. "The paper they had fed into the press was unusually thin and light, of the sort found in a phone book or a Bible. This had not gone well. Midway through the printing process, the paper was supposed to cross a gap; flung from the top of a rotating belt, it needed to soar through space until it could be sucked upward by a vacuum pump onto another belt, which was positioned upside down. Unfortunately, the press was in a hot and humid place, and the paper, normally lissome, had become listless. At the apex of its trajectory, at the moment when it was supposed to connect with the conveyor belt, its back corners drooped. They dragged on the platform below, and, like a trapeze flier missing a catch, the paper sank downward. " How, I asked Esther, was an article on copiers written with such literary mastery? We came to the conclusion the New Yorker had handed out a handful of topics to write on. The author, Joshua Rothman, had drawn the short straw and ended up with copy machines. Instead of being disappointed by his banal assignment he decided, "Oh yeah? Well I'm going to write the best article ever written about copy machines!" And he did. After our opening scene where we meet the engineers who are facing the problem of the lissome paper, Rothman takes us back in time, through the history that has led us to the modern copy machine. It all starts back in 1440 when Guttenberg invented the printing press. Though some advancements are made in the centuries between, the paper jam doesn't emerge in the replication process until the 1960s. This is because it takes up until this time to introduce multiple sheet printing. In 1938 a huge advancement in copying take place. In this year Xerography is invented, which is the process of using static electricity quickly and precisely to manipulate electrostatically sensitive powdered ink, a.k.a. toner. (That's right, you wondered what the hell toner was and why your copier keeps telling you it need it? Well, there you go.) With the invention of Xerography, copiers are faster and able to process sheet after sheet of paper, but it is the convenience of this rapid process that has led to the global frustration of the paper jam. Though every year technology improves in exponential jumps, for some baffling reason paper jams never seem to disappear. "There are many loose ends in high-tech life. Like unbreachable blister packs or awkward sticky tape, paper jams suggest that imperfection will persist, despite our best efforts. They’re also a quintessential modern problem—a trivial consequence of an otherwise efficient technology that’s been made monumentally annoying by the scale on which that technology has been adopted. Every year, printers get faster, smarter, and cheaper. All the same, jams endure." The problem lies in the fact that though the modern copy machine is an incredibly precise machine, the paper used is still natural, coming from the pulp produced from trees. "'Paper isn’t manufactured—it’s processed,' Warner said, as we ambled among the copiers in a vast Xerox showroom with Ruiz and a few other engineers. 'It comes from living things—trees—which are unique, just like people are unique.' In Spain, paper is made from eucalyptus; in Kentucky, from Southern pine; in the Northwest, from Douglas fir. To transform these trees into copy paper, you must first turn them into wood chips, which are then mashed into pulp. The pulp is bleached, and run through screens and chemical processes that remove biological gunk until only water and wood fibre remain. In building-size paper mills, the fibre is sprayed onto rollers turning thirty-five miles per hour, which press it into fat cylinders of paper forty reams wide. It doesn’t take much to reverse this process. When paper gets too wet, it liquefies; when it gets too dry, it crumbles to dust." It is these natural fibers that put unseen variables into the equation. Engineers have to focus not only on the machines they are fixing and creating, but they also must visit paper mills worldwide in order to make advancements in paper technology. But just like anything coming from the natural world, it seems impossible to completely weed out the discrepancies. Rothman leads us through this unseen world. Copiers play a monumental though subtle role in our lives (just wait till you get to the part about Chicago crime rates) and the problem of the paper jam is a metaphor for the "elemental battle between the natural and the mechanical." Technology inexorably continues to advance, but it seems that perhaps there will always be hangups, that natural taking its unexplainable and random revenge on the mechanical. In true literary fashion, Rothman takes us on this long journey only to drop us back off at the beginning, with the engineers staring at computer diagrams of the paper jam in Asia. Rothman asks a handful of the Xerox employees if they think the problem of the paper jam will ever be eradicated. Most seem skeptical. They turn their minds back to the task at hand, as long as paper jams persist they will have problems to solve--their elemental battle continues. ​Read the full article from the New Yorker here. Now that I'm not in Paris I don't have as much access to amazing performances, but I still would like to keep up with the writing I've been working on. I've spent the past two years as an art creator, making new performances and taking them all over the country. Now I'm taking a little break from being a creator to be a consumer of art. And I suppose one of the important things about being a consumer is to not just react to something on a surface level, but to be critical and thoughtful toward it too. So upcoming will be thoughts and critiques on the many things I've been coming into contact with, and how I compose those thoughts into something resembling a coherent analysis. A coworker and I spend a lot of time on the line at work sharing new music we've encountered. We've been talking about the incredible music coming out of Philadelphia right now and he introduced me to this band that has now been accompanying me on all my walks through town for the past week. Painted Shut is a graceful and poetic existential crisis. Powerfully sung by Frances Quinlan, Painted Shut is the third studio album from Philadelphia based band Hop Along. The album is a collection of directly or obliquely personal stories, allegorical references, and homages to forgotten music legends. It questions the legacies we leave and how we will be remembered, or just as likely, forgotten. The songs are preoccupied with how we are viewed through the eyes of others. Quinlan's voice is the sonic representation of this inner struggle. Often her voice becomes unrestrained and her calm, melodious singing breaks into that beautifully desperate and vulnerable scream. It shatters your heart and your resolve every time. Two biographical songs, Buddy in the Parade and Horseshoe Crabs tell the stories of musicians Charles "Buddy" Bolden and Jackson C. Frank respectively. Both musicians were considered influential, but eventually suffered breakdowns and a loss of confidence and passed into obscurity. The forgotten haunt this album: an unmarked grave in Happy to See Me, an old man in Sister Cities hiding behind red flowers and a painted shut window, a West Virginia waitress in I Saw My Twin who is left behind as the band moves on to its next tour location. Quinlan laments the connections that were never made, how its our own fear and indifference toward forging bonds with the outliers that cause these people to disappear. In contrast to Quinlan's sadness for the forgotten is her fear of being remembered infamously. Guilt and shame over inaction permeate many of the songs. In Powerful Man the teenage Quinlan does nothing as a father abuses his son for looking at her and in Sister Cities the "false friend" keeps his back turned as the protagonist of the song learns "the fierceness of man / Again, again, again!" In the song Waitress Quinlan sings from the perspective of a waitress who is connected to one of her customers through a shared relationship. The other partner comes into the restaurant to be served and the waitress worries, "She must've known who I was / the worst possible version of what I had done." The waitress knows this woman will only recognize her for her weaker and more shameful moments and this causes her to fear how this other woman judges her, but just as quickly she rationalizes her actions through the same assumptions made in so many of the other songs; is she really important enough to be remembered? Because "by the time it's old / a face will have been seen / one and a half million times / ...and I'll share a very common poverty." The poverty of being forgotten, because as she sings in Buddy in the Parade, "Fool, all you touch on this turning dream / is either gonna be burned or buried." Just as many of the characters turn their backs on the suffering of others, Quinlan also turns her back on religion, but questions this choice. She is annoyed by having her morning coffee disturbed by Jehovah's Witnesses in the song The Knock, but by the end of the song she notices, "did you see the look on the face of the kid he brought with him? / I never once seen a teenager look so radiant." She is moved to tears by the calm and self-assuredness brought to this teenager through his religion and questions why she didn't talk to them. The other character in the song however questions her sentimentality, telling her "everyone is suffering." Quinlan shys away from religion again in I Saw My Twin when she sees a nun eating in a West Virginia Waffle House. Her ambivalence toward religion leads her to call the nun "a great black hole of providence," but as an afterthought she still asks someone to "please take pity upon the heart that lives in me." She is turning away from a religious answer to all her questioning, but she still hopes some sort of providence will intervene to give her clarity. The song that ties this whole album together, and perhaps answers all of Quinlan's questions for itself is Happy to See Me. In this song the narrator battles with trying to change her mind on how she views situations in her life, because just like the danger of "a defeated army headed home," if her feelings remain bitter and defeated she will only leave destruction in her wake. There are times though when the memories get the best of her and "tumble from the bridge / up and into the dark / thought up by a mind that must have been / a sort of sinister question mark." The song leaves us with the narrator on a train, hoping that in the end whenever she sees people from her past they will be happy to see her. She hopes that just as she is trying to do, people can be strong enough to allow their love to outweigh all the painful memories that cause them to trip upon their moralities. Just like the YouTubing father in the middle of this song, she is also saying, "People of the world, nobody loves you / half as much as I / half as much as I am trying to." Maybe she hasn't quite succeeded in working it all out, but the point is she is trying, because in the end we all end up shouting into whatever void will carry our desperate thoughts, hoping maybe someone will remember us fondly, if for nothing else, at least for how hard we tried. A stylistic connection was obvious between Circus Remix and Grande (the first show I reviewed in this blog). Both shows were divided into multiple sections, had a strong focus on individual stunning tricks, and utilized inventive wordplay. And this would make sense considering the creators of these shows at one point had a company together called Ivan Mosjoukine. Though the members of this company now perform separate shows, their creative origins are still fully apparent in their new work. Maroussia Diaz Verbèke, the creator of Circus Remix, takes the wordplay a step further though. She has created her own term, "Circographe," to define her role in the circus. 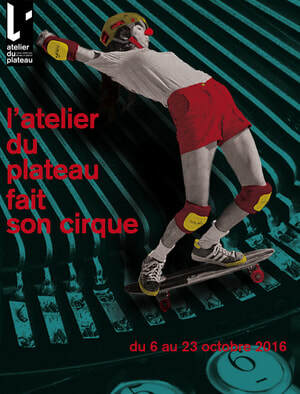 Related to dramaturgy, though not entirely similar, circographie is the creation of text that is specific to circus. This use of text was ubiquitous in the show, from the opening scene where Verbèke holds a series of signs explaining she will use words and movement to share her inner thoughts with the audience to the nearly nonstop projections of stream of consciousness writing. The projected words were accompanied by their verbal recitation, a jumble of sentence fragments Verbèke had collected from numerous interviews and pieced together to explain her own thoughts during the show. The show had many moments of stunning acrobatics, most notable a walk on the ceiling, dangling upside down by her feet as she crossed a horizontal ladder. There were also many moments of failure and accepting the limits of human physicality. At one point Verbèke circled the room showing off an antique circus poster of a woman diving from a high board to land in a handstand on a chair below. The spectators groaned and covered their eyes. After already witnessing several daredevil acts that seemed impossible, this seemed like her insane denouement. But it wasn't. Verbèke laughed, tossed the poster to the side, and moved on to the next, more subdued, part of the show. One of the reasons I appreciate French contemporary circus so deeply is that they are able to tell an incredibly evocative story through simple means. 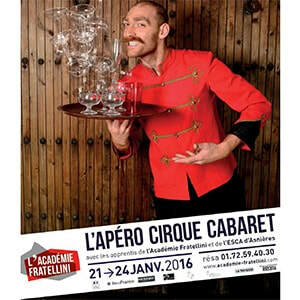 The Académie Fratellini's Apéro Cirque series is a reoccurring event to present work from the school's apprentice program. Held in the school's smaller chapieteau with a three-quarter round stage and no set, the third year apprentices shared the story of a young boy named Mehdi. Mehdi likes to wear lipstick, and throughout the show he battles with his own confusion of identity as well as ostracism by his peers. Solo acts evoked various childhood emotions, while ensemble pieces showed the challenge of interacting with one's peers when not conforming to the normal social expectations. The poetic nature of the text was reflected in the apprentices' movements, from the opening scene of Mehdi's birth to the final scene in which each apprentice carried a piece of a Mehdi puppet-- holding an item of clothing that when put together showed the fragments that compose a young child, but not the child who occupied them. The audience is left with a final image of the tactile objects we use to represent identity, but they are hollow constructions, Mehdi's true image is left to our imagination.